Effective and thorough cleaning of your house exteriors, vehicles, gates, objects and various other things would require the use of a high capacity pressure washer with top notch features. Additionally, with a supreme quality pressure washer you would also need a pressure washer pump which is able to generate high pressure with low flow comparing to various other applications of pumping. So, the pressure washer pump you’re using should be compact, economical and lightweight. Here. We’ve made a list of the best pressure washer pumps that are ideal for the pressure washer system you use. One of the most usable pumps that comes pre-filled with oil and is sealed for saving on maintenance costs. With the pump you save more money than purchasing a brand new pressure washer. All you need to do is remove 2 hoses and 3 bolts to take out and just install the pump and it’s done. The Homelite Universal Pressure Washer Pump 2800 PSI is 2.5 GPM and fits well with a number of models and is a good replacement option for the Homelite 2700. The Pump is simple to install and has a pressure handling capacity of 2800psi. Homelite 2800 is already filled with pump oil and doesn’t require any other measures to operate. Just fit the pump to the washer and it’s ready to use. 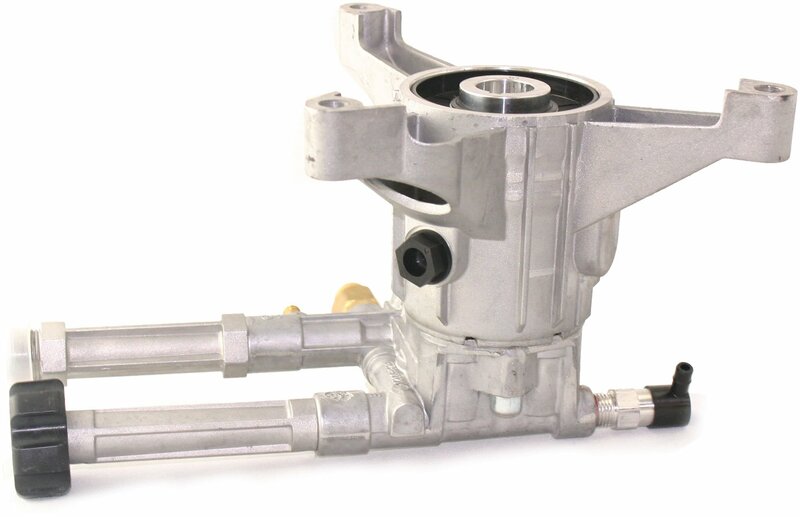 The pump operates on Briggs and Kohler engines with a diameter of around 7-8 inch. Higher power with a pressure power output of 2800psi. Excellent fitting and works well. The Generac 3000 PSI pressure washer pump works charms for all your cleaning and washing needs and has all the innovative functionalities to make your tasks simple. This product is suitable for anyone who is searching for HD pump. The pump is simple to install and works great for getting precision. The pressure washer pump here is a little larger than the original, so you’ll need to make a few adjustments. The pressure washer pump fits perfectly on a number of pumps from different manufacturers. The pump throws a total power output of 3000 PSI for proper washing and cleaning. The pump bolts well with any machine and the process takes only a few minutes. The thread size on this pump is standard ¾ hose bib and is compatible with all pressure washers. The product measures 3/4” shaft and 1 9/16” deep mounting and holes 2 5/8” squared center to center and work well till 3000 PSI of pressure. Briggs and Stratton Pump Kit is one of the most used pumps for cleaning and washing tasks. The pumps mechanism is simple and installs easily on any pressure washer device. You’ll get this product with different bolts and spacers. To provide utmost care to this pump you need to, which oil to use for maintenance of the pump unit. With this version of Briggs and Stratton the pressure hose and water gets installed through the back of machine instead from the front. To get a proper fit for the pump the chemical containers must be removed. The pump kit comes with a Briggs engine with a shaft unit of 7/8” and easily fits on any type of pressure washer. The kit installs in less than 10 minutes and starts functioning soon after. The pump is recommended for anyone who wishes to buy a new unit or just a replacement pump for pressure washer. Supports models such as 020293 and Troy Bilt pressure washers. Simple and easy installation with a total time of 10 mins. Works fine as an alternative replacement unit for Briggs. Provides 200psi more power from genuine Craftsman pump. Replacement time of 30 minutes. Doesn’t match the stock unit. One of the best quality pressure washer pumps available in the market. 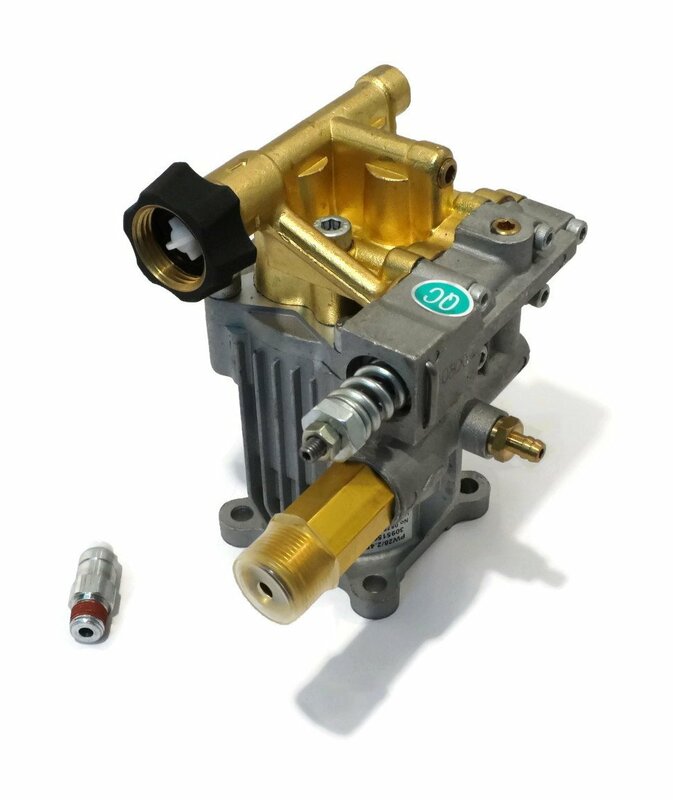 Annovi Reverberi 3000 PSI pressure washer pump is designed through the strongest materials for providing a pressure power support of around 3000 PSI at 2.5 GPM, making it a great choice for industrial pressure washers that would require support for extra power. The pressure washer is conveniently simple to install and provides a much smoother response than generic pumps. The pump comes with a soap/chemical valve. Might not work with every model. Universal 3000 PSI pump works great as a direct replacement pump for Try Built Model 01903 with Honda GC160 Engine. The pump is direct bolt on without any shims, washers and adapters. You’ll need to take out the old dis-connect through your old unit or buy a new pump. Works fine as a replacement unit for other pumps and the installation process completes in less than 15 minutes. The Universal 3000 pump works flawlessly on most pressure washer products without any leaks. According to many users the Universal 3000psi is a much better replacement for the original Honda Generac Husky. This replacement pressure washer pump comes with greater power and reliability than the standard pump. High power rating which can sustain a pressure limit of 3000 psi. Seamless working with high pressure performance. Genuine replacement part for Generac. Works seamlessly for longer hours. Comes with horizontal shaft for high pressure replacement. Installation might take time on certain models. With these pressure washer pumps you’re always assured that the replacement pump would be of a high grade quality than the standard one which gets replaced. 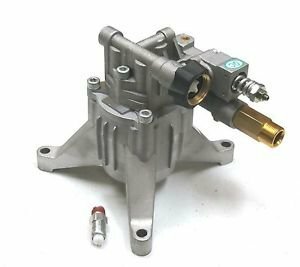 These pumps are ideal in case you’re finding a replacement for defective or a faulty pressure washer pump as the issue which is responsible for the fault can reoccur easily. 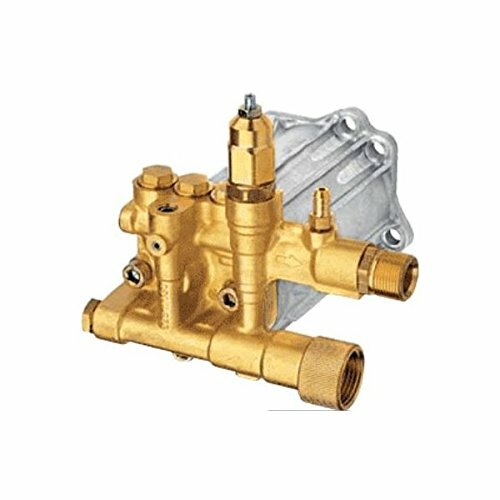 The most vital features you get with these pumps are high ratings for PSI, that are present in the soap/chemical injection valves of those that have them, and also the garden conversion kits meant for customers who need to convert their typical hose to a water hose with much higher pressure capacity. The pumps which are mentioned here would be an excellent replacement decision for your pump system. These pumps come with a universal fitting providing you market’s highest quality pump. These pressure washer pumps are constructed and designed through the strongest materials that specialize in providing the high pressure support for different pressure washer engines. Bring out the best in your pressure washer by attaching these pumps to your system and make them work for a great washing and cleaning experience. Before you make a purchase for ideal replacement pump, you need to know about the right recommendation. Aforementioned pumps are superior in quality and provide much better functionality than the default pumps that come with pressure washer systems. All these pumps are universal fit and work well with any brand of gas pressure washer. All these pumps are the most demanded replacement parts in the market and are competitively priced. 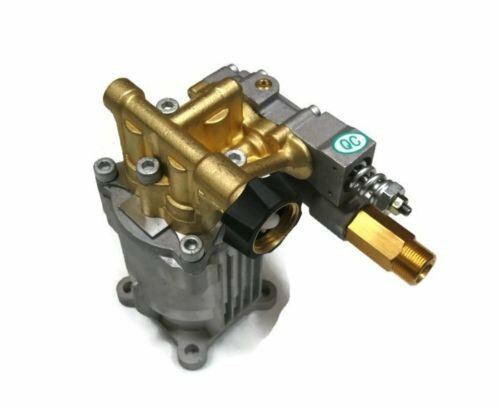 Replacement pressure washer pumps acquire an excellent market reputation for their fine quality. Before buying, you must make sure to select the one which complies well your requirements. Suppose you’ve got a pump with low power so for you it doesn’t make much sense to buy a pump with a support for much higher PSI. Make sure to check the price factor and also the functionality. Of course you’d like an economical solution if your needs aren’t much. If your search is for a more heavier and durable pump, you can go for the Briggs and Straton or other 3000 PSI pumps for a few bucks more. Replacement parts are ideal for not only just pumps but for many other things too. You’d surely like to alter the settings of your current pump if your cleaning needs aren’t being met. Thus, in the same way you’d like to get a better replacement parts for your pump. So with these ratings and reviews of pressure washer pumps you’ll be able to select the right one for your cleaning requirements. Check the Make sure to check specs and dimensions of the pump for a proper fit. How To Remove Pump From Pressure Washer? How to Clean a Power Washer Pump?